With these Vegan Party Recipes, you will have a great start in the New Year. Not only do we have special drinks for you here there are also tasty and delicious dips, snacks, salads and more. This will make your party a success and everybody will have a happy, satisfied and healthy start in the new year. The drinks and snacks will be loved even by none vegans and may let them think about a healthier lifestyle. Some may like to join Veganuary and start a plant-based diet, to begin the year with the commitment to improve wellbeing. These vegan party recipes will help to change the mind of people. Get ready for a great New Years party a great time to enjoy with friends and family. Start with happiness and a positive mind for the successful and healthy Year 2019. Choose your favorite New Years Pary Recipes and enjoy New Year’s Eve. For those who prefer to stick to the bubbly on New Year’s Eve, these sparkling pomegranate margaritas by Minimalist Baker are even tastier than straight champagne. Personally, any blue drink looks like a hangover to me, but that doesn’t mean they aren’t cool AF. This Curaco martini by Veganosity is a party drink, that’s for sure. If you’d like to pretend it’s already summer of 2017, this mango mojito by Vegan Richa is delicious and refreshing. Horchata can easily be made vegan, and this Minimalist Baker recipe is a great holiday drink to add to the mix. For your PSL-loving friends, this recipe by Veganosity will help them remember pretty much the only thing that was comforting about Fall 2016. Another snack that will make you a hero to your vegan guests, these Minimalist Baker vegan cheez-its are actually easier to make than you’d think. Another good finger food, these cauliflower wings by Vegan Richa are absolutely delicious. 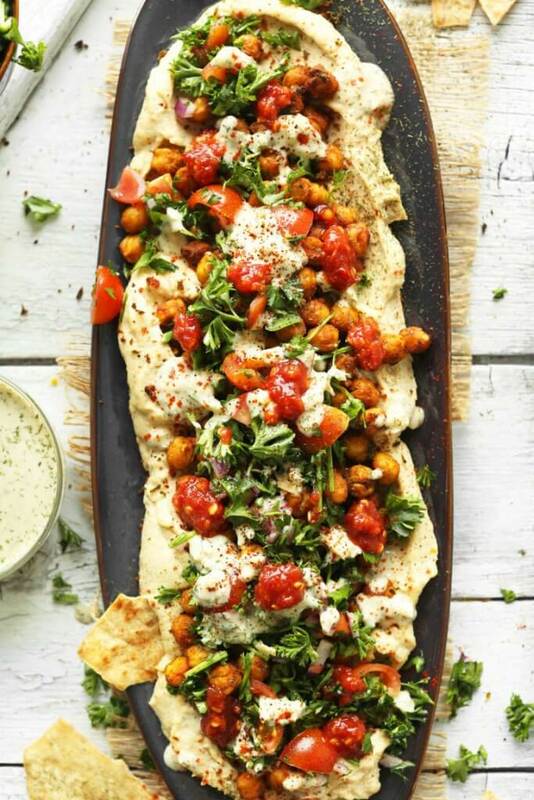 Vegans are all about that hummus, so take things next-level with this beautiful shawarma spread by Minimalist Baker. Hello, lover. While this might be dangerous if you don’t put a sign for those with peanut allergies by the dish, these rolls by Veggie Primer are too unique and sweet/savory to pass up. Another party staple, these candied almond by Oh She Glows are perfect and simple for healthier buzzed snacking. In terms of finger food, it doesn’t get much prettier or tastier than these pinwheels by Minimalist Baker. How pretty is this? This spicy smoked cheese by My Darling Vegan should fool your non-vegan guests quite nicely.